Dining area can seat 6; plus seating at the kitchen lunch counter! Lunch counter seating, and look a double door refrigerator! 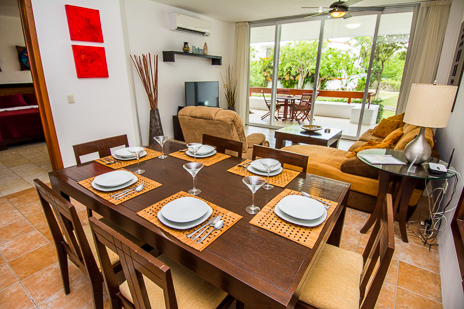 Enjoy meals or icy cold drinks on your private terrace! Rates do not include 19% local fees. 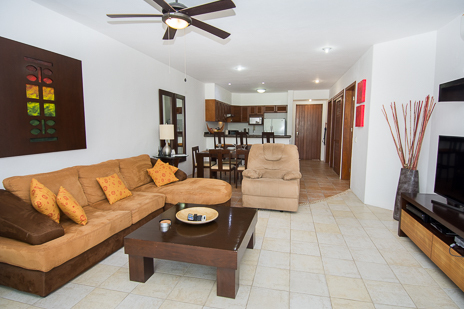 More about RR 7110 . . .
Quality abounds in this charming 1 BR condo at sought-after Residencias Reef (located on one of Cozumel's finest beaches!). 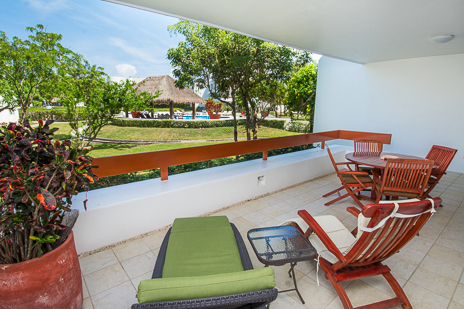 RR 7110 is a 1 Bedroom, 1.5 bath condo in Building #3 and has all of the amenities on your wish list . . . Satellite TV (2 of them! 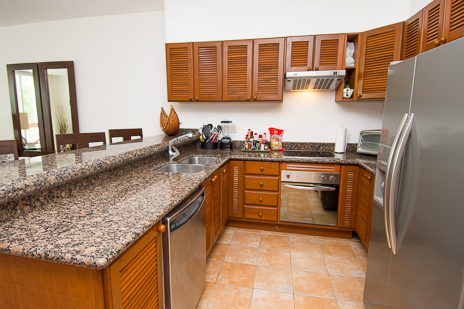 ), FREE WiFi, FREE calls to US and Canada, FREE parking, 24 hour security, full kitchen, games, DVDs, comfortable furnishings, washer and dryer, ground floor unit and more! 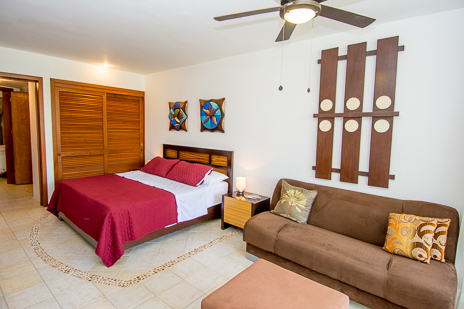 Beach lovers will be in heaven at Residencias Reef. You can walk for miles along this sandy shore. And divers will be close to Cozumel's best dive sites. 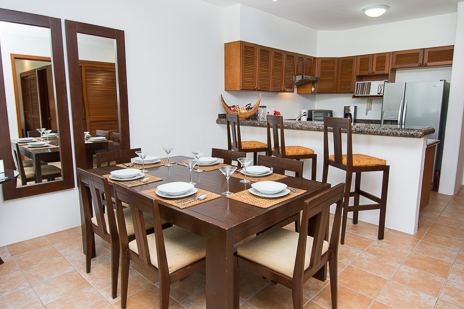 You can't go wrong with Residencias Reef condo #7110! 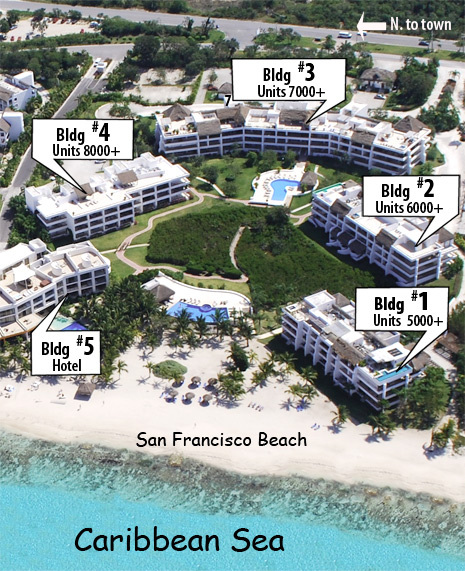 Residencias Reef Condos are located approximately 11 miles south of town on San Francisco Beach, one of Cozumel's finest beaches. There are several beach restaurants within walking distance that are open during the day (10-5). 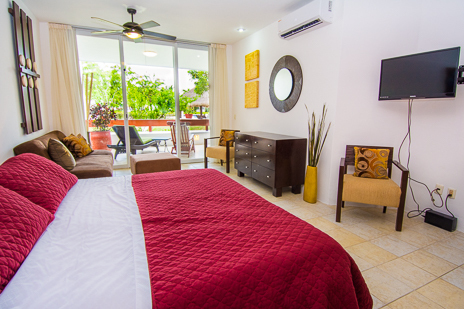 Residencias Reef is is located just minutes from some of Cozumel's best known dive sites. You can walk for miles along this stretch of sandy beach. Dive boat pickup. There are 4 convenient locations for dive boat pickup near Residencias Reef: 1) Pier in front of Bldg. #5; 2) 300 yds. south at San Francisco Beach club (no pier); 3) Pier at Paradise Beach (just south of San Francisco Beach); 4) 300 yards north at Sabor Resort (Sand Dollar or San Clemente pier). Before you book your dives, check with your dive operator to see which site they will pick you up. Building #1: Units begin with the number 5 (5100, 5120, 5200, etc.). Located on the south side of the pools. Building #2: Units begin with the number 6 (6100, 6130, 6200, etc.). Located approximately 50 yards behind Building #1. Building #3: Units begin with the number 7 (7130, etc.). This building has an elevator. Building #4: Units begin with the number 8 (8100, 8140, 8200, etc.). Located approximately 150 yards from Building #1.